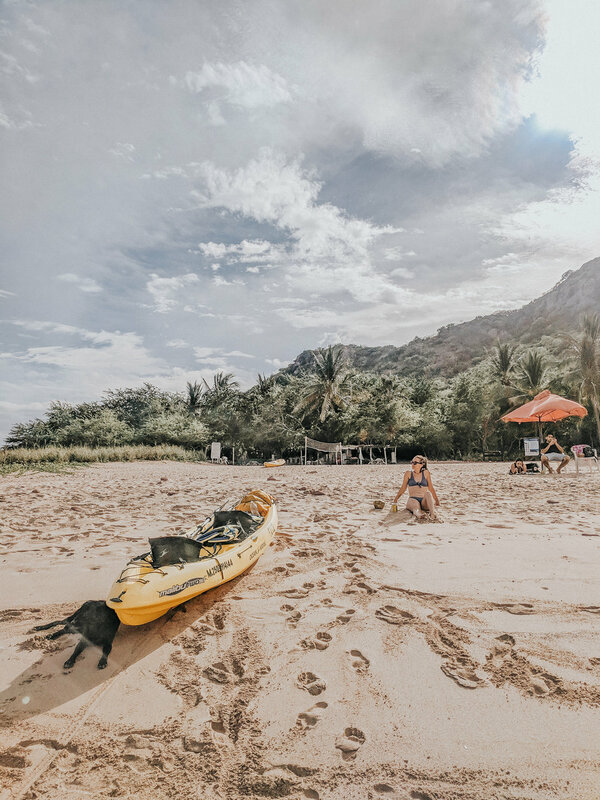 Mainland Mexico is a whole different world than Baja! Once back in La Paz, we went straight to the ferry office to book our overnight passage to Mazatlan the next day. Everything we'd read about the ferry said it was wonderful, as long as you got a cabin. If you didn't it was a nightmare. They were sold out of cabins. The next day we ran errands, got lunch at a new vegan restaurant and hung out until it was time to leave for the docks. Our ride out of La Paz coincided with another one of it's fantastic sunsets and the 20 minute ride was mostly along the coast. It was a great way to say goodbye to a city that had surprised us in a good way. The bike strapped down on the ferry. We got to the port and I was anxious about doing all the steps properly after our Tijuana debacle. The first person checked our VIN against our paperwork and spoke perfect English so it ended up being very easy. We got weighed with the bike and all-in-all we are over one thousand pounds! Bike is running and handling well though, so I guess that's just fine. We boarded easily and found the bar and settled in, mentally preparing ourselves for a night on the couch. Rachel put our name in at reception in case there were any cabin cancellations, but we were trying not to bank on it. They had a buffet dinner where we were able to get: rice, beans and tortillas! They had some goofy entertainment which Rachel absolutely loves. There was even some crowd participation and the fact that it was all in Spanish did not stop her from getting involved. It was great to see Mexicans having fun and laughing together. So much of our interactions with locals come when they’re doing their jobs and we're customers. It's my goal to get more experiences where that's not the case. Not easy though. A couple cocktails into the evening, our name was called and we had scored a cabin. We went to check it out and put all our gear down, and we realized just how much better our lives had become. We slept decently (and far better than we would have in the bar) and disembarked in the AM. I had to wait an extra 45 minutes before going below to the bike and spent that time chatting with a group of motorcyclists from Mexico City. At first we talked riding but eventually we got to Trump and economic theory. Luckily their English was better than my Spanish for that conversation. Wonderfully hospitable people, and they offered anything we could want in Mexico City. I mentioned we were looking for gloves for Rachel and one started digging in his bag to give me his gloves. I was able to talk him out of it, but that's the attitude here. Outside our hostel in Mazatlan, Funky Monkey Hostel. We got to Mazatlan and stayed at the Funky Monkey Hostel. Since it was morning and we felt good, we decided to rent a kayak and paddle over to an island for a beer. That evening we realized we were a lot more tired than we thought, so we just did laundry and crashed early. The island we kayaked to in Mazatlan. The next stop was San Blas, and we rolled in just before sunset. It had the feeling of our first truly Mexican town. Baja is so different somehow, and all the people there (there aren't many) are used to motorcycle travelers coming down. We weren't necessarily unique there, but in San Blas we had a few people come check out the bike as soon as we pulled into the gas station. We tried to game the weather and leave in the afternoon the next day as we of had a couple hours to ride and it had been clouding over the last couple afternoons. It did not, and we left when it was about 90° with not a cloud in the sky. We rode through the jungle to Sayulita, by far our best ride day of the trip (in my opinion). We had heard from several people Sayulita was overrun with tourists and not even worth going to. I agree with the only the first part. The climate and vegetation reminded me of Lahaina, HI and I looked up the latitude and Sayulita is almost exactly the same so I guess that makes sense. Lunch in El Rosario, our stop halfway from Mazatlan to San Blas. The town itself is “cute cute cute” and reminds me of a couple towns in Thailand that have become backpacker havens. I get why people say it's touristy, it certainly is, but there needs to be a different word to isolate this experience from a resort town. Here, there a dozens of really unique shops, a hippie vibe, and fire dancers with live music in the streets at night. It's not the same as a resort city where there might be dozens of stands selling the same inexpensive merchandise and swim-up bars. Hard to describe, but I think it's certainly worth a visit. 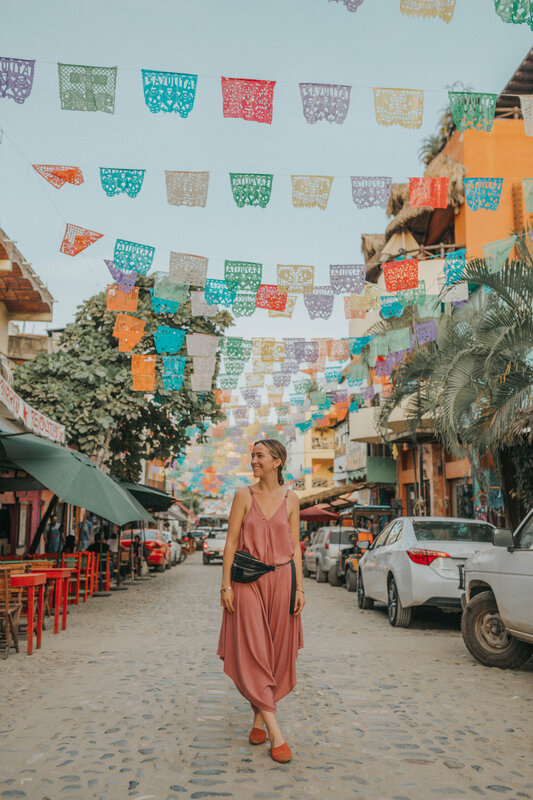 We talked to an Irishman at our hostel who had a great perspective: sure, it's not an isolated “authentic” Mexican village, but that's why there's so many great restaurants and great live music. I appreciated the permission to like the town. We have just been hanging out here, getting massages on the beach, taking surf lessons, eating fantastic vegan fare and drinking margaritas like they're going to be discontinued any day. Hard to leave, but I think for every week we stay, we'd have to cut an country off the end off the trip for budgetary reasons. Next we plan to head inland and to the cold so we can feel like it's really Christmas time. Guanajuato is our next target for a few days stay, but we'll get back to the beach after dropping South through Mexico City.